This article is specific to voters who successfully received a notice, but destroyed it or otherwise cannot access it to vote. If you are looking for help with a voter who never received their email notice in the first place, please visit our article on that topic. To make a long story short: you cannot re-send the original notice to a voter who received the notice, and then for whatever reason, lost or deleted the email. Our cost is associated with email distribution, so we do not facilitate re-sending an email that was successfully delivered by Electionbuddy, and then was destroyed due to human error. This is one of the many reasons why it is important for election administrators, and the organizations they represent, to do a thorough job announcing and reminding their members about the election - they will be less likely to delete the email if they understand what it's for. You can send these voters an email reminder. The default reminder contains the same information as the original email notice, so they can use the reminder to access the ballot and vote. Access the voter list as the election administrator. Identify the election you want to manage, and from its actions menu, choose the "Voter List and Status" link. 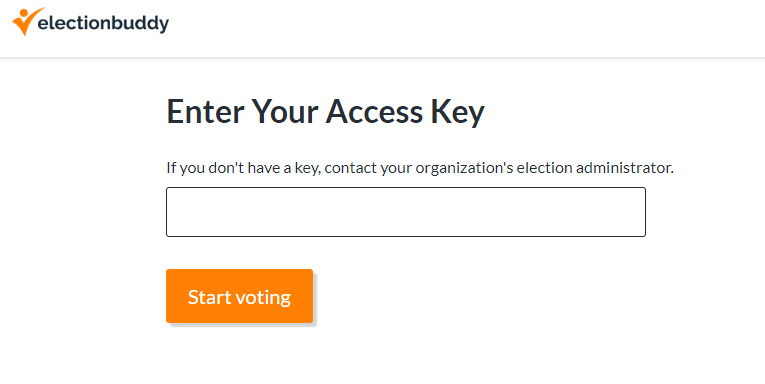 Share the access key with the voter by emailing it to them with your own email program, or phoning the voter, and sharing the access key - you just want to do this in a confidential manner. Direct them to https://app.electionbuddy.com/ballot. From there, they will see the screen below, prompting them to enter their access key: That will take them to your ballot!